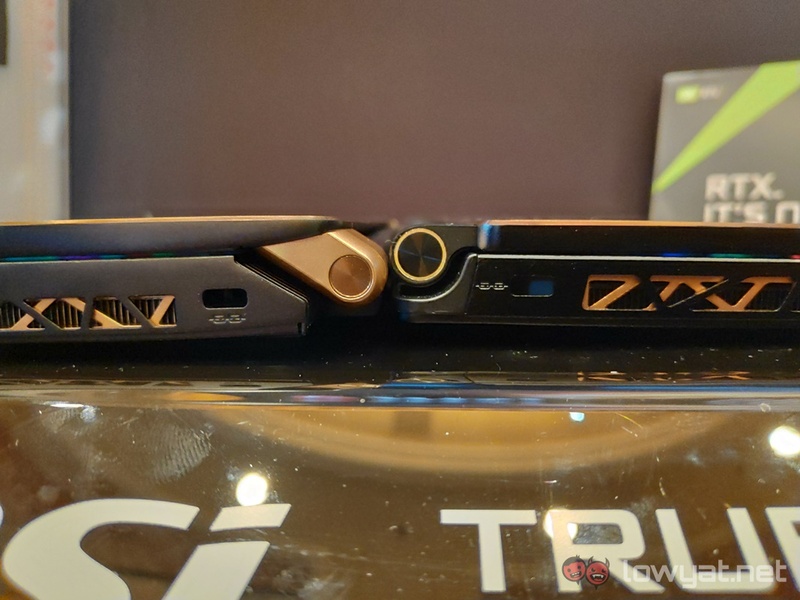 While CES 2019 won’t officially begin until tomorrow, MSI – like so many other brands on site – held its keynote a day earlier in order to officially lift the veil off a couple of devices. Chief among those two devices was the GS75 Stealth, a brand new 17-inch thin and light gaming notebook. The GS75 Stealth has clearly taken a cue (or two) in the design the department from its predecessor, the GS65 Stealth. If anything, it’s almost a carbon copy of the GS65 Stealth, save for its size and slightly (but understandably) thicker base. Other design differences include the notebook’s hinges, which at a glance looks a lot sturdier and durable than the ones on the GS65 Stealth. As for its hardware, the GS75 Stealth comes with all the trimmings you’d expect, plus a couple of nifty improvements. Firstly, the notebook houses a total of three PCIe NVMe SSDs, all of which are replaceable. While MSI did introduce the storage improvements, the brand didn’t quite explain if all three SSDs were running in a particular raid configuration. However, given the odd number of SSDs, it’s likely that the three storage medium are configured to run in a RAID 1 configuration. On another note, the GS75 Stealth is listed as having an 8th generation Intel Core i7 CPU as its top-tier core. 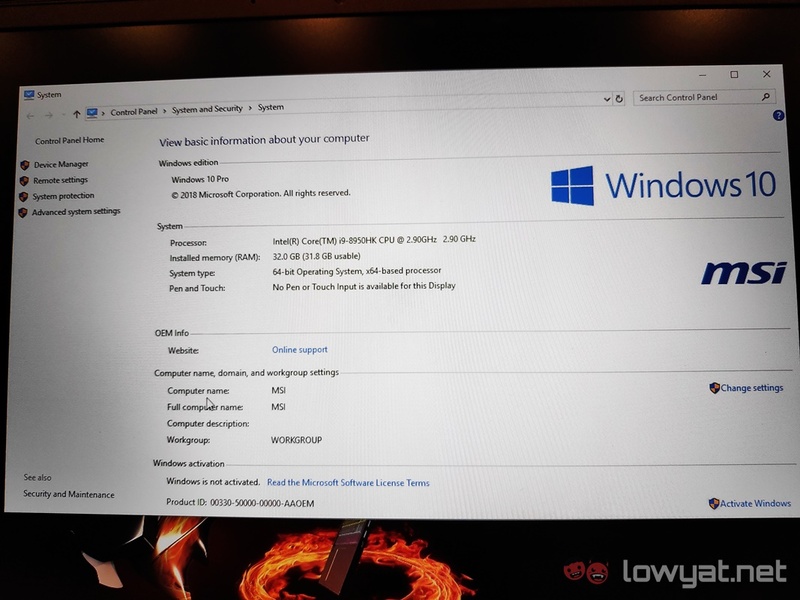 However, the model we saw at MSI’s keynote listed a Core i9-8950HK inside. Of course, the main attraction of the GS75 Stealth is undoubtedly the NVIDIA GeForce RTX discrete GPU within it. 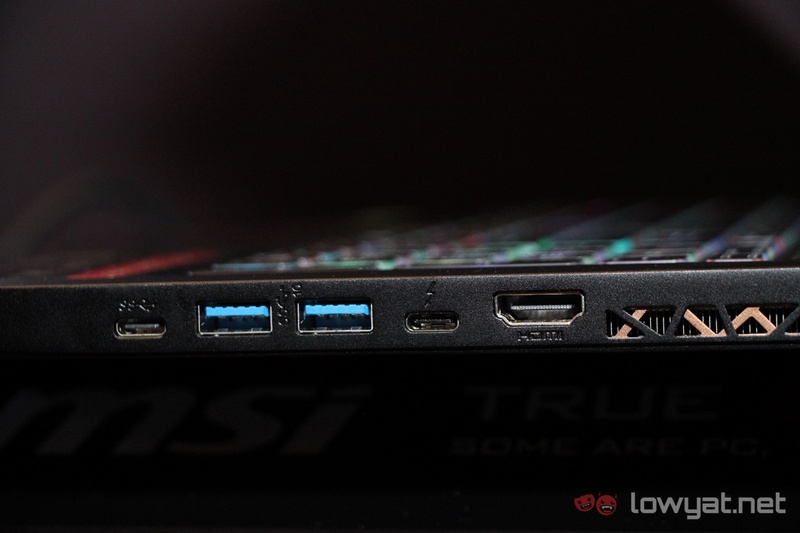 In this notebook’s case, MSI has installed a GeForce RTX 2080 Max-Q inside of it. Yes, you’re not misreading that last sentence; the RTX 2080 inside the notebook is based on the same power-efficient Max-Q Design that was first introduced back two years ago. 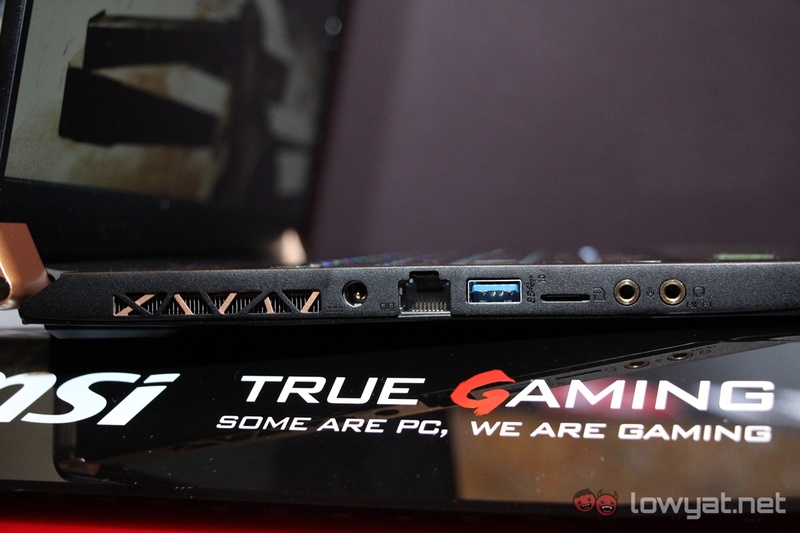 For cooling, the new notebook uses an upgraded version of its cooling technology called Cooler Boost Trinity+. It goes without saying that the presence of the RTX 2080 Max-Q means that RTX-capable titles such as Battlefield V and Bioware’s upcoming title, Anthem, will be able to take full advantage of the discrete GPU’s real-time ray-tracing capabilities. Along with the brand’s new DLSS (Deep Learning Super Sampling) anti-aliasing technology. Beyond those key features, the GS75 Stealth sports many similar features and hardware as its smaller predecessor. Again, barring its slightly larger girth, this means that you get up to 32GB DDR4 RAM, a 17.3-inch Full HD display which can run at a 144Hz refresh rate, a per key RGB full-size keyboard. 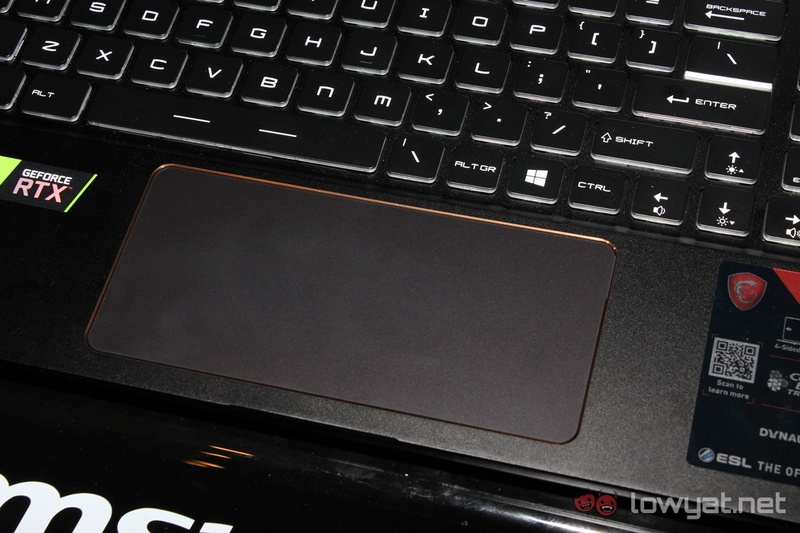 As well as the same larger-than-average trackpad at the base. At the time of writing, MSI wasn’t able to provide us with a local availability or pricing for the GS75 Stealth. 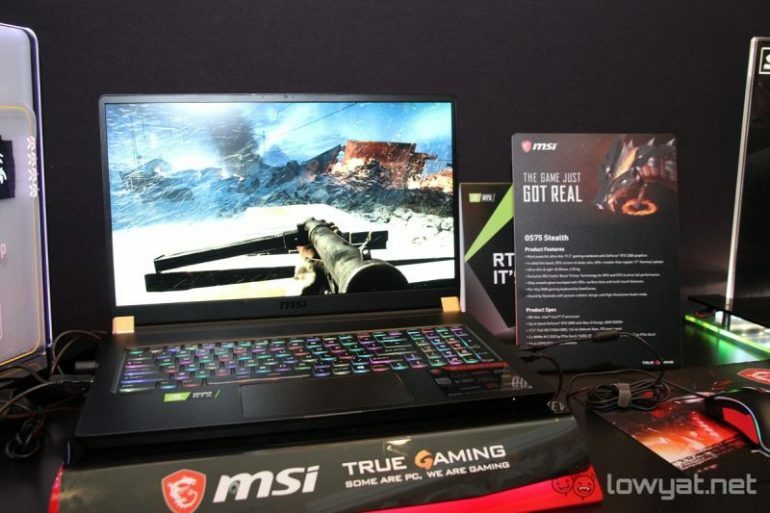 That said, it’s both very likely and possible that MSI will launch the notebook sometime in February, just after NVIDIA’s 29 January embargo for the RTX-powered notebooks lifts.